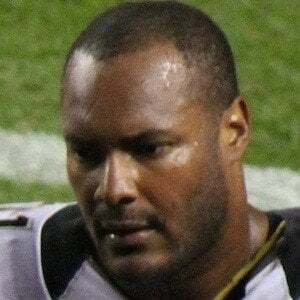 Pro Bowl defensive end and Super Bowl champion with the New Orleans Saints who spent his full 10 year career with the team after being drafted 18th overall in the 2004 NFL draft. He was a BCS National Champion with the Ohio State Buckeyes in 2002 and was named a first-team All-American the following year. Before that, he was the top defensive line prospect in the state of New York coming out of high school. After his career in New Orleans came to a close, he was signed to the New England Patriots off-season program, but never played for the franchise officially. He had two children with his wife Racquel, and had one other child from a previous relationship. He was fatally shot after exchanging words with a man who had rear-ended his car. He was a teammate of Drew Brees for all but two years of his NFL career.